a route of 12-15 pools to clean every weekend). "Having a father that is an Army Colonel certainly can keep a kid busy." Ric graduated and sold the pool company to a competitor. 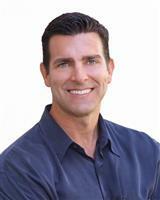 He then attended SDSU as a business major while working for Coldwell Banker in the San Diego area. On April 4th 1988, Ric moved to the Conejo Valley and has enjoyed living there and served the community in real estate ever since. "The Conejo Valley has been a blessing in my life. I enjoy the lifestyle here. I enjoy selling property here. I met my wife here!" Since Ric & Mindy are both active and sports oriented it's no coincidence they met at the gym. "It took a three year friendship to realize we should be dating and an additional three years for me to realize this is the person I will marry." Married in Calabasas September 18, 1999, Ric & Mindy now live in Wood Ranch. Ric spends his free time practicing martial arts (Thai Jiujitsu-Black Belt and Brazilian Jiujitsu-soon Purple Belt) and riding motocross bikes. Mindy is involved in a women's soccer league. But they both have a passion for snowboarding in deep, fresh, untouched powder. "I thought it would be appropriate to propose marriage on the mountain with my board still strapped to my feet (Brighton UTAH)." They can often be found on local mountains, Mammoth Mountain, Snowbird, Solitude or Brighton Utah. Ric and Mindy are the proud parents of two children, Bryson and Brooke Prete. Bryson is now 13 years old and Brooke is 8. Mindy is now a full time mom. If you are considering buying or selling property now or in the near future, set a meeting and get to know Ric. You will see why people use Ric time and time again for all their Real Estate needs. He is easy to work with and very diligent!